Yes, literally, how lonnggg is your love? 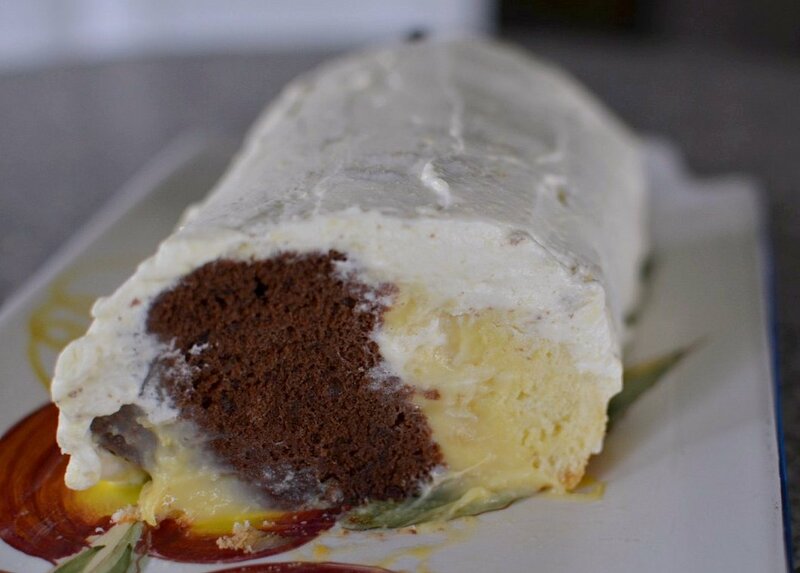 Just in time for Valentine's Day, a meter cake recipe from East Europe. Six months ago I stumbled upon Chili Vanilla, a little cafe opposite Wisma Merdeka. The chef is a Hungarian lady, the menu is limited but generally the food is good although I would've been happier if the goulash was more of a soup than a stew. I heard meter correctly but the cake didn't look one meter long. The lady explained that breaking the meter-long cake into two was easier for display. I love Chili Vanilla's meter cake. It was soft, the custard gooey and best of all, the chocolate coating was delicious and fun to eat because it was slightly sticky and springy. I was told by the waitress that it was ordinary chocolate ganache. I think otherwise though. 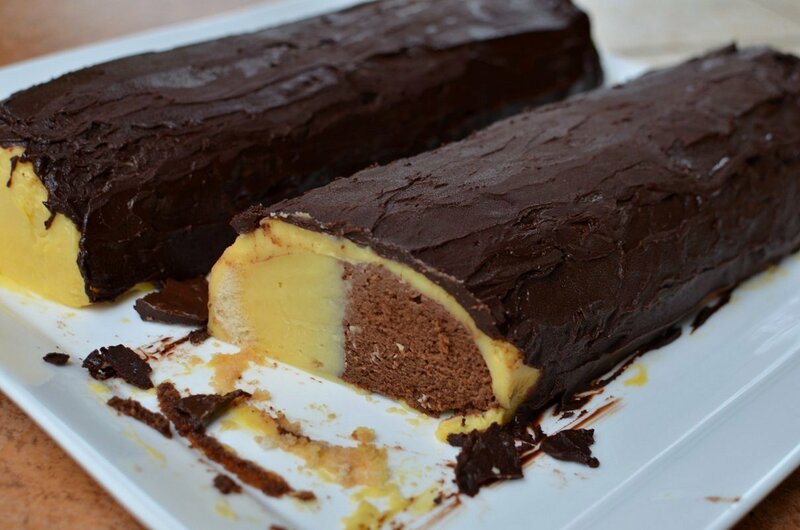 There's only one meter cake recipe on the Net, as far as I can search, and it's here in a lovely Croatian food blog. I made the cake for my bro Joe's birthday (other than signifying long-lasting love, the meter cake can signify a long life) and everybody liked it but like most first-time food that make a deep impression, I prefer Chili Vanilla's version for several reasons. The choc coating and the custard were too firm after chilling in the version I made. As usual, I reduced the sugar but the biggest mistake I made was not using Valrhona chocolate powder, which I usually do for all chocolate recipes. The cake texture was beautiful, moist and soft without being spongy. I would use this cake batter for other cakes in future. I really like the idea of a long piece of cake which guests can slice off according to their appetite. It will be so dramatic and showy on a buffet table, especially if it's strewn with berries. But I'm in tropical Asia and berries are expensive so I got hold of a durian and added some durian in the custard in my second meter cake. 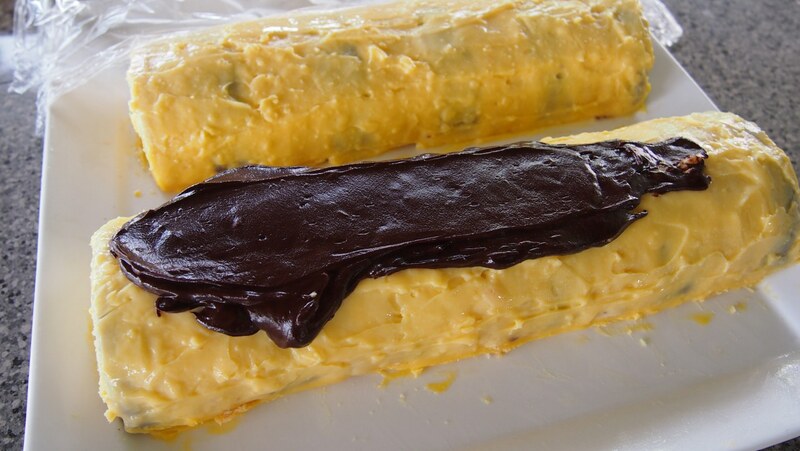 Instead of chocolate ganache, whipped cream with mashed durian was faster and cheaper to make than chocolate ganache. Besides, choc ganache is so rich it softens before the cake can come to room temperature. You know what? The durian meter cake was yummy, especially after a night of chilling. The custard was made without eggs so it stayed soft and gooey even after chilling. Even if you don't want to make it one meter long, make a shorter cake using half the cake recipe. My son Ming thinks that for the durian meter cake, plain vanilla cake without chocolate cake would be better. I agree. Great cake to make to express your long, long-lasting love especially on Valentine's Day tomorrow. Sandwich the slices of cake with the custard. This cake is more dramatic and true to its name if you serve it a meter long. Cover the cakes with the remaining custard. Chill. Cover the cake with melted chocolate. The original meter cake. Slice cake diagonally to get both flavors. 1. Preheat oven to 180 C. Grease and flour two semi-circular loaf pans. You can half the recipe and make one cake first if you have only one loaf pan. 2. Put 100 gm sugar, vanilla, water, oil and yolks into a bowl. Sift the flour and baking powder over and mix well into a thick batter. 3. Whisk the egg whites with the remaining 50 gm sugar until stiff peaks stage. 4. Pour the batter into the stiff egg whites, folding to mix well. Divide the batter into two. Sift the cocoa powder into one batter, mix well. 5. Pour the white batter into one pan and the brown choc batter into another. Bake 40 to 45 minutes or until a wooden skewer in the center of the cake comes out clean. 1. Put half the milk, the yolks, sugar, custard powder and vanilla into a bowl and whisk to mix well. 2. In a small pot, put the remaining milk to just about boiling point and add the milk and yolk mixture in, stirring well with a small whisk over low fire until the custard is thickened but not too thick. 6. 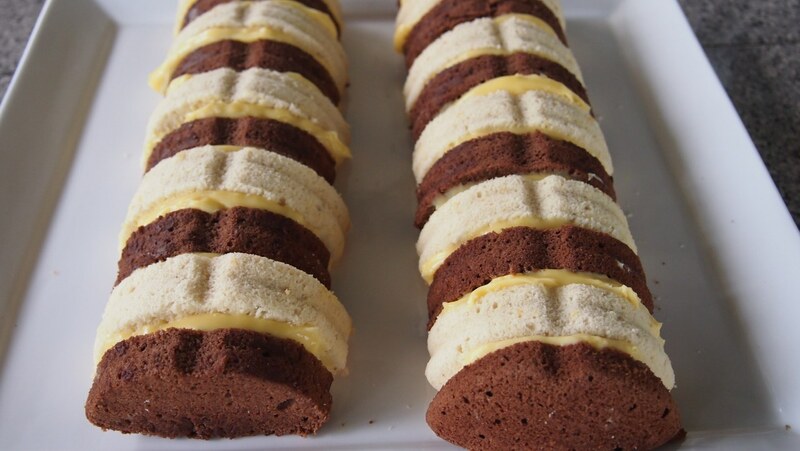 Cut the cooled cakes into 2 to 2.5 cm slices. 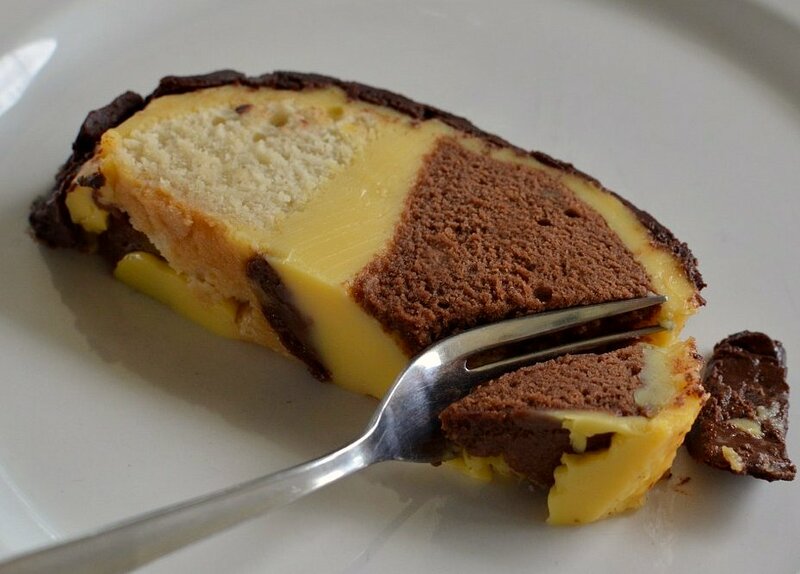 Use the custard to glue the slices together, alternating white and brown slices. 7. Coat the cake with the remaining custard and chill. 8. Coat the cake with the chocolate glaze. 9. Slice cake diagonally to get both flavors in each slice. --Melt the choc and milk over a pot of boiling water. Remove and add the butter. Cool and use to coat the cake. --Melt choc and cream over a pot of boiling water. Cool and use to coat the cake. 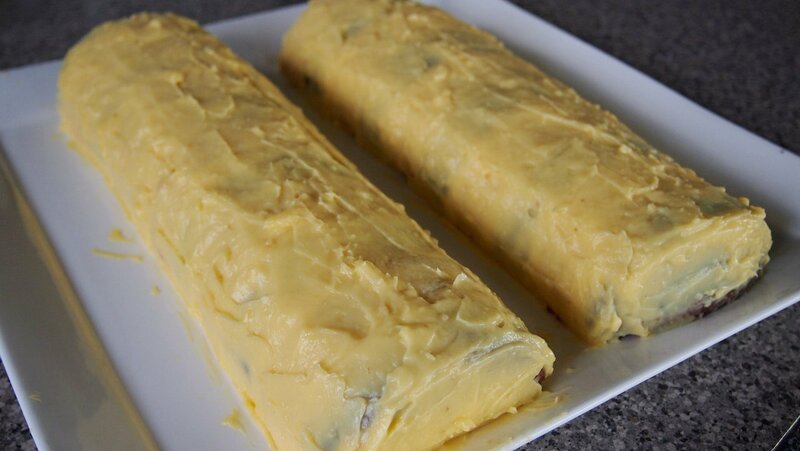 For the durian meter cake, add about 70 gm mashed durian to the soft custard and use the custard to glue the cake slices together. Whip some (about 300 ml for one cake recipe) dairy cream until stiff and mix in 70 to 100 gm durian mash. Use to cover the whole cake. Chill before serving. Thanks for the lovely piece about the meter cake. I did not know that such a cake existed! At first, I was thinking: "Meter cake, really???!" Haha. It looks like a christmas log upon first glance though. Hehe. Thanks for sharing this. This is the first time seeing Meter Cake, looks new to me. Good job! So cool... but somehow I prefer the look before it is convered with custard! michelle: yes, new to me too. quite a brilliant idea yes, two flavors n colors and a long shape to slice off as you like. cookie: ah, you can leave it plain and serve extra custard n choc on the side i suppose. I know I will turn the kitchen in a mess if I attempt the cake now.... oh, you were wondering what cacao is, right? It's something like chocolate but it's not chocolate. It could be along the same path as carob. waverley: oh it shd be a meter long but i don't hv the plate or board for it. i may have made a mistake about the ingredients. i used cocoa powder for 'powdered chocolate' n a friend pointed out tt it could be drinking chocolate powder. what do you think? why u didn't use pudding powder for custard cream? By the way, this cake is so simple and so marvelous! I've made it so many times and we always enjoy it! But my recipe is slightly different..